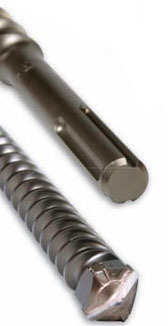 SDS MAX (TE-Y) Carbide Tipped Rotary Hammer Bits. Larger diameter bits with a shank of approx. 7/8"
What is SDS, SDS Plus and SDS Max? There is a lot of confusion about SDS and SDS Plus and SDS MAX (TE-Y) bits and what kind of drills they fit. SDS or Slotted Drive System (or SDS Plus of SDS+) was developed by Bosch in 1975 for use in it's smaller rotary hammers. SDS (or Slotted Drive System) bits for hammer drills/rotary hammers allow the bit to slide in the chuck and enhance the hammering action of the tool. SDS-Max was developed later for larger hammers. SDS and SDS Plus are different names for the same shank. Shank size is approximately 3/8" (10mm) in diameter, with 2 open drive slots and 2 closed retentions shots. Maximum hole size for these drills is around 1" depending on who makes the bit. Dewalt calls these drill SDS, Bosch calls them SDS Plus. Any bit in our catalog that is called SDS Plus or simply an SDS will fit any rotary hammer that specifies SDS or SDS Pus or SDS+. SDS-MAX is a different size all together. Shank size is close to 3/4" (.7" or 14mm) in diameter. Instead of 2 drive slots there are 3 open drive slots and 2 closed retentions slots. This is designed for large hammers, with a maximum bit diamter of over 2"